Arcoveggio Hotel, Bolonia, Włochy : Rezerwuj teraz! 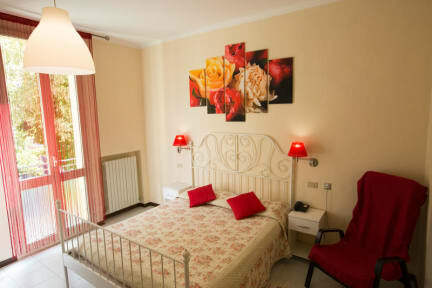 We are a small family hotel situated in a peaceful area of Bologna. Our 23 rooms are divided in two separate three-storey buildings nearby (no lift). In the front of the hotel you can find a garden iwhere you can enjoy relaxing atmosphere and refresh yourself with a cold drink after a day of sightseeing in our beautiful city. The free wi-fi connection is available in the entire property. Please remember that the reception is open from 07:00 a.m. till 11:00 p.m. The check-in time begins at the 02:00 p.m. and ends at 10:00 p.m. After this time reception is closed so it will be impossible to make registration and to take the room. We will be happy to welcome you! Since May 2015 we are family run business and we strive to provide the best service. Our friendly and international staff is multilingual. We will be glad to assist you during your stay. If you wish we can help you to organise your sightseeing, trip to some other destination like Venice, Florence, Milan, Rimini etc., to rent a bike or just recommend you a nice place to taste the real Italian cuisine. 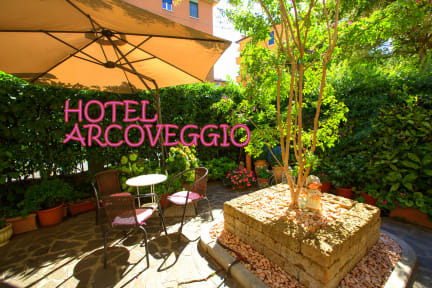 Arcoveggio Hotel is located in city area of Bolognina, good known specially for the Ippodromo dell’Arcoveggio – the hippodrome of Bologna where you can watch the horse racing (5 min walking). Our hotel is also conveniently situated near the Central Train Station of Bologna (10-15 min walking) and near the BolognaFiere Fair District (about 20 min walking). To reach the historical downtown you need to walk about 25-30 min or simply take a bus from the stop nearby (10 min). We are also very close to the well known private clinic of Villa Erbosa (10 min walking). In our neighbourhood you can find also many small italian and international restaurants and fast-foods, shops, supermarket and a park with playground for children.